Line cupcake tin with 18 liners. Prepare cream cheese filling and set aside. In a small bowl, combine water, oil and vinegar and vanilla. Stir into flour mixture until well blended. Half fill each lined muffin cup w/batter. 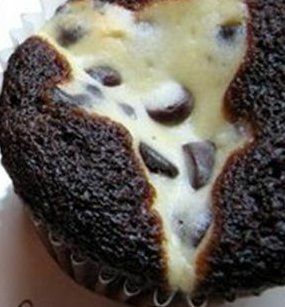 Place a spoonful of cream cheese filling into center of batter in each cup. Beat first three ingredients until smooth, fold in chocolate chips.